THERE is not much father-of-three Wayne Rudd would not do to help children get the start in life they deserve, from door knocking for donations to delivering bread to families. Nothing is too humbling for the retired baker who through his sons is witnessing the power of education to change lives and break down barriers brought about by poverty. “We’ve had some tough times, but with The Smith Family we’re one big family… through adversity, we’ve learned you can come out on top,” Mr Rudd said. The children’s charity this month launched its winter appeal to raise $230,000, in the hope of supporting 600 children through learning and mentoring programs across six communities including Midland. Working with partner schools, The Smith Family gives disadvantaged children the extra support needed to stay in education and continue further studies or work. Partnerships are in place at Midvale, Middle Swan, Woodbridge and Swan View primary schools where Learning Clubs provide additional support. 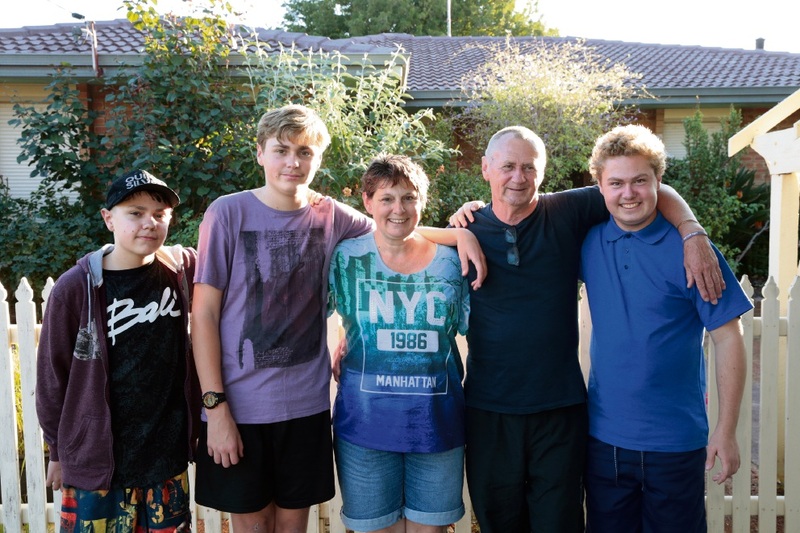 Mr Rudd and his partner Vicki, a disability support worker, and their sons Joshua (15), Jack (13) and Conrad (12) belong to The Smith Family’s Learning for Life program. The program gives access to The Smith Family’s educational programs and financial assistance from sponsors to fund educational equipment and related expenses. “I’ve always told the boys with a solid education and a good sense of humour you can go anywhere,” Ms Rudd said. The Rudd teenagers each have a sponsor and exchange letters with their benefactors at least once a year to share news of their progress at school. Eldest brother Joshua is gaining in confidence at Kalamunda Education Support Centre, while Jack is an ‘A’ student in maths at Kalamunda Senior High School. The Middle Swan family’s journey with The Smith Family began seven years ago through a school referral before they moved to Ellenbrook. “Joshua has autism and can’t be left on his own; when he was younger he had many appointments and only one of us could work,” Mr Rudd said. Along with the financial stress came the worry of optometrists struggling to identify the cause of a health concern over Conrad’s eyesight. “He had a lot of appointments and during that time missed quite a bit of school, which contributed to him falling behind with his reading,” Ms Rudd said. The Swan View High School student joined The Smith Family’s literacy program, an educational initiative to stop children falling through the gap. The student2student program works by matching children who need to improve their reading with trained peer buddies, who listen to students read several times a week. Research shows one of the best ways to support students with reading difficulties is for the help to come from peers. Student2student operates nationally via landline, mobile phone and digitally, with Optus providing services to reach households with no home phone line in rural areas. Conrad joined the program for a year. “Before I joined student2student, I didn’t enjoy reading but I do now, and I had a real rapport with my reading buddy,” he said. Through the family’s links with The Smith Family, older brother Jack attended a sports camp at UWA. “The camp was something to look forward to after school,” Jack said. Other gains have enabled the family to become better at managing their budget by joining the charity’s Saverplus program. “The Smith Family will match dollar for dollar a family’s savings up to $500… it was amazing, we were able to buy each of the children a Tablet,” Mr Rudd said. To sponsor a child, donate or volunteer with The Smith Family, visit www.thesmithfamily.com.au and learn more about educational programs on 1800 024 069. 1 in 7 children and young people in Australia live in poverty. 32.6 per cent of disadvantaged children start school below key learning areas. Only 60 per cent of students from low socioeconomic homes finish Year 12.